From our blog at Target Marketing magazine: What are the economics of producing and distributing a direct marketing video? And, how does it line up with costs for direct mail? If you’re a traditional direct marketer who has lived and breathed marketing costs, then running the numbers should come naturally. For this discussion, we’ll use direct mail as the comparison because historically it’s the distribution channel of choice for direct marketers. We’ve created a “Video Budget Checklist” that helps you itemize cost comparisons of creative, production and distribution between video and direct mail. If you’d like a copy, contact me. It’s free for our readers. Direct mail can come in all sorts of configurations. Low-cost postcards. A simple package of a letter and flyer inside an envelope. Or more expensive with multiple enclosures such as a letter, fold-out four-color brochure, lift note, order form, reply envelope and outer envelope. Sometimes the outer envelope is a custom size or has an oversize window, or there are expensive die-cuts on cards or tip-on elements that are outside of typical print configuration. The fixed costs to create each of these packages by employees, agencies, or freelance creative teams are pretty broad, from several hundred dollars to well into the five-figures when using proven top-flight direct response creative professionals. A wide range of configurations can apply to video production, just as it can to direct mail. You can pop out a 45-second video using your Webcam or flip-camera and post it on YouTube. You just have to ask yourself if the poorly lit, distracting background, muffled or echoey sound of that presentation exemplifies your organization. Alternatively, the video could be purely voice-over with words scrolling along on the screen. Or you can make it visually more alive with photography images or stock video footage. At a more costly level, you might shoot testimonials or interviews in a studio or shoot on location to demonstrate your product. Of course, length impacts cost (just as the number of components impacts cost in direct mail). There are a lot of variables that go into video production, just as there are for direct mail. The point is this: Start with a budget you’re comfortable with, talk with writers (ideally writers experienced in both direct response print, online, and video), develop a video script and storyboard, and work with a skilled video editor. Don’t just be wowed by special effects on someone’s demo reel. Dig in and learn what results were produced from some samples or case studies. You might just want voice-over with images on screen (see our last blog post [link to http://bit.ly/OVMDD-051612] for an example of a 3-minute video and details of how we adapted it from a direct mail package). If your personality is a draw, you can record yourself on a small camera that can fit in a pocket with a lav microphone for under $200, total. Make sure you have good lighting and background. Or spring $500 or so and get a green screen and lights. That’s the equipment we use to shoot our video for this blog. Be aware, assembling the right equipment and editing software is the easy part. Knowing how to use it all to your best advantage comes from training and practice (or hiring a pro). For direct mail, you have list costs (if you’re renting names), data processing, printing, lettershop and postage. The cost can range widely. If you’re testing in small quantities, you’ll pay more per piece. 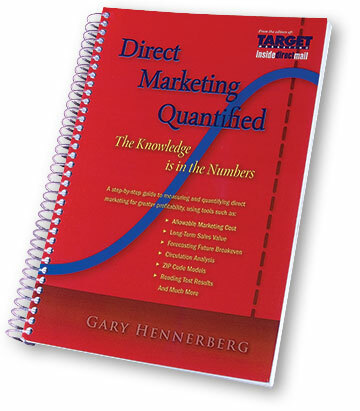 Knowing the volume of prospects (or prior customers) to mail, the marketer calculates how many responses are needed to make a specific profit (or break-even) objective, translate that number into a required response rate to meet your objectives (your allowable marketing cost), and presto, you can use the test of reasonableness to see if the numbers pan out. For video, your distribution cost is driving viewers to your landing page. You might email your customer file, or rent a list, and give the reader a compelling reason to click to your landing page to watch the video, possibly opt-in for more information, or attempt to convert to a buyer then. You will need to include the cost to set-up the landing page and related items. We suggest you begin with a budget where your objective is to create a video for the amount of money it would cost to produce a moderate to elaborate direct mail package (although video production on the cheap is possible – and might work). Then compare the cost to print and mail a direct mail package versus that of emailing (whether it’s to customers at a low cost to email, or rent an email list at a higher cost). And add in the cost for developing your landing page. Chances are your cost per contact will be less for email and the landing page, but as we all know, it’s all comes down to the cost per sale or lead so bring your focus back to this metric. One example worth mentioning is that of the Dollar Shave Club. Perhaps you’ve read about it. A big success for a 1:34 video that reportedly cost $4,500 and after a few days generated over 12,000 orders. The video has now been viewed over 4.6 million times. You can read about it here. Bottom line: just as you’d run the numbers to see if it makes financial sense to use direct mail, you need to run the numbers for video, too. And you just might be surprised how favorable the numbers look to reach out and explore video. 181 million U.S. Internet users atched nearly 37 billion online content videos in April. 85.5% of U.S. Internet audience viewed online video.